General Sir Adrian Bradshaw has degrees in Agriculture (BSc Hons, Reading University 1979), Defence Studies (MA, King’s College London, 1991) and International Relations (MA, King’s College London, 2005). He has also been a Visiting Defence Fellow at Balliol College, Oxford (2011). He joined the 14th/20th King’s Hussars in 1980. As a junior officer he served in Germany, Northern Ireland, Africa, the Middle East, South East Asia and the Falkland Islands, first as a tank troop leader and Regimental Intelligence Officer, and then detached from his Regiment flying helicopters followed by a further troop-level command tour. He commanded twice at squadron-level, on armour with his Regiment and then detached with another unit, serving in Germany, the Americas and the Balkans. From 1994-1996, he commanded the King’s Royal Hussars (KRH), first providing the enemy force at the UK Armoured Training Area in Alberta, Canada, and then as Battlegroup Commander on operations in Bosnia. After command, he went on to the UK Higher Command and Staff Course, and served in Military Operations in the MOD. On promotion to brigadier, he went to 3rd (US) Army in Kuwait, planning for Land operations in Iraq. He then became Deputy Commander of US Task Force West in the Iraq region before Commanding the UK 7th Armoured Brigade in Iraq. After attending the Royal College of Defence Studies in London, he became a Component Director in the MoD, being promoted in post to Major General in Nov 07. 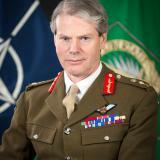 In Mar 09, he took command of 1st (UK) Armoured Division based in Germany, training brigades for operations in Afghanistan. He has since attended the US Army Strategic Leadership Programme (Advanced) and the US Joint Pinnacle Course. He became Deputy Commander of ISAF in Afghanistan in late 2011 and Commander UK Land Forces in Jan 2013. He assumed his final appointment as DSACEUR on 28 Mar 2014-stepping down in Mar 2017. General Bradshaw is married to Sally. They have 3 children and enjoy gardening and lurchers. In addition General Bradshaw shoots, plays polo and sketches with watercolours. Check out the incredible speaker line-up to see who will be joining General Sir Adrian.